This month we've focused on Jesus' commandment to love our neighbors. We've discussed how important it is to love our actual neighbors, the ones in closest proximity to us. I hope this month has made you long for community and recognize how simple and beneficial it is to be in community with your neighbors. Going slow and meeting your neighbors is the beginning. You can love and serve them, share meals with them, and before you know it you're doing life together. We were reminded that neighboring starts with us first. Hospitality has to be given to ourselves for neighboring to be done with joy and not obligation. There are seasons of life where we can be more gracious with ourselves in this area. But neighboring is not just good for others; it it good for us too. Jesus wasn't kidding or joking when He said to love our neighbors as ourselves. I hope as we've shared others' stories of community you've been inspired by the Jesus' way of neighboring. Has this series helped you in your neighboring journey? I'd love to hear your stories or questions in the comment below. I pull the jar out of the fridge. It's a canning jar in which we save the strained bacon grease. I spoon some into the pan to melt it down. And soon we'll have a perfect beginning to almost any meal. People love bacon. It can elevate roasted vegetables to something otherworldly. It makes beans and greens close to nirvana. And that fragrance. 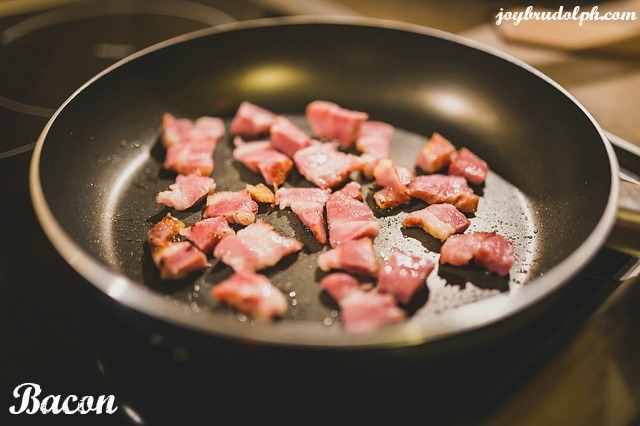 The unmistakable scent of bacon wafts through your home and out your windows. It welcomes people through your front door. Everybody can recognize it's salty smell. And most everybody comes running when they do. And this is how I hope my faith will be. That a life lived in light of the Gospel will be a pleasing aroma to God and to others. That once people get to know the real Jesus they'll find a God not based on religion but on grace. They'll find the true Lover of their souls. They'll smell the fragrance of Jesus and fall in love. Because if you know who Jesus really is, a God-man who gave up everything for the undeserving to rescue them from death, you can't help but love Him. Several weeks ago I woke up not feeling well. At 9:00 in the morning I was in my pajamas, unshowered and on a business call that had been rescheduled so I could go back to bed. During the call I started receiving a series of odd text messages from my best friend. I thought perhaps they were supposed to go to someone else and that her timing was poor. After my meeting I noticed she had sent me a picture of an ad here in Houston. I was confused and excited and finally I figured it all out. My friend Christine and my husband had surprised me with her flying in for a surprise visit. When I talked to her on the phone she told not to do anything to get ready for her arrival. I want to remind you that I was in my pajamas and hadn’t even had my coffee yet, much rather breakfast. I'd been stuck on the couch for days and my house was a bit of a mess. And the airport is roughly 20 minutes from my home. So not only did I have very little time to prepare for her visit, I was not feeling well enough to do any of the things I would have liked to do. So I wrote a welcome message to her on the chalkboard in our dining area and started to prepare my breakfast. By the time Christine arrived I was still in my pajamas, still unshowered, and finally eating my breakfast. The guest room was not prepared and there was dog hair everywhere. And she and I had one of the best weekends I've had in a long time. We ate delicious food and cooked together. I tried to show her a bit of the city and we went on bike rides. Jason did a bit of cleaning and Christine and I talked endlessly for the first time in months. And it was all so good for my soul. And I remembered that some of the best moments of connection have little to do with the state of your home but the openness of your heart. As we develop new relationships in Houston, it is tempting to want to present our best selves and only have someone over when the details of our home are just perfect. And that is why I'm so thankful to be in relationship with my neighbors. They have seen my home at its best and its worst. And as I expose who I am more and more, they are seeing me in my best and worst states. And this truth, of lived in homes and imperfect lives, makes people feel welcome. It encourages them to be vulnerable and reminds them that they're not "the only one." 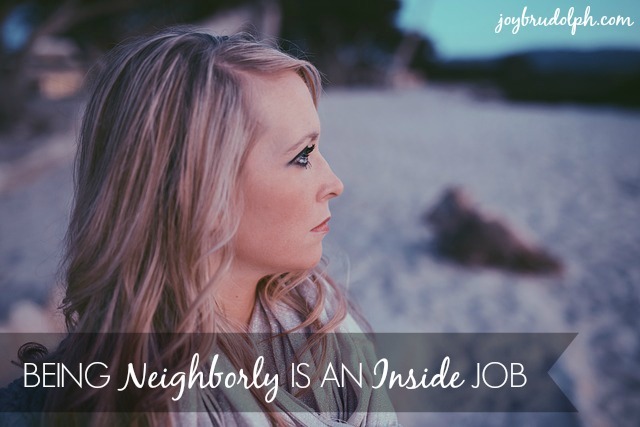 Are you practicing authenticity and vulnerability with your neighbors? I'd love to hear from you in the comments below. This post if part of the 31 Days of Neighboring series. Most of the things I do with my neighbors involve a table and a meal. From my experience I think you need both large community-wide events and smaller more intimate gatherings. If the thought of planning a large-scale event intimidates you here some simplified event planning tips. Choose a type of event. For large gatherings potlucks and cookouts work well (see this post for menu options and recipes). Craving something simpler? A s'mores night, coffee and donuts on a Saturday morning, or an ice cream sundae bar are simple and affordable ideas. Choose date, time, and location. 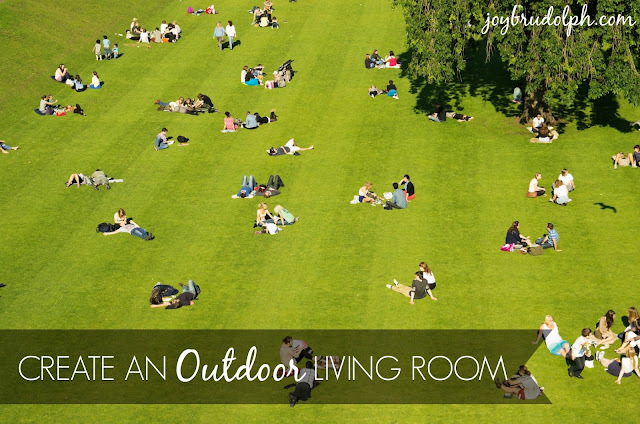 Your front yard, community center or courtyard, or a local park are great neutral choices. 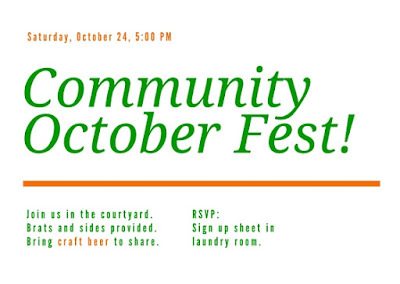 Invite your neighbors. You can use an Evite or social media platform if you're connected with your neighbors online. 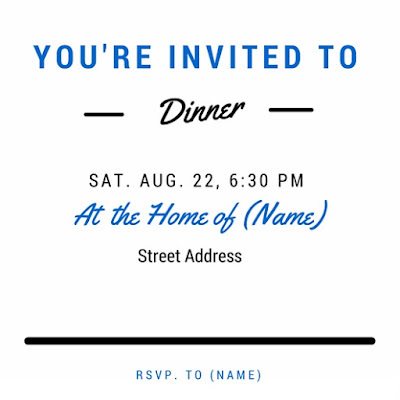 But paper invitations hand delivered (or left at the front door are) are a great personal touch. (See below for free editable options.) Our neighbors do well with two weeks notice but yours may require more or less time. We also like to text "save the date" messages for certain events. Shop for your event. Begin making a list of things you need as soon as you begin planning your event and add to it over time. Will you needs tables and chairs, or picnic blankets? What kinds of paper goods do you need? What about food and drinks? Let your neighbors pitch in and don't be afraid to ask to borrow things like folding tables and chairs. Make a schedule. What can you do ahead of time? What has to be done the day of the event? 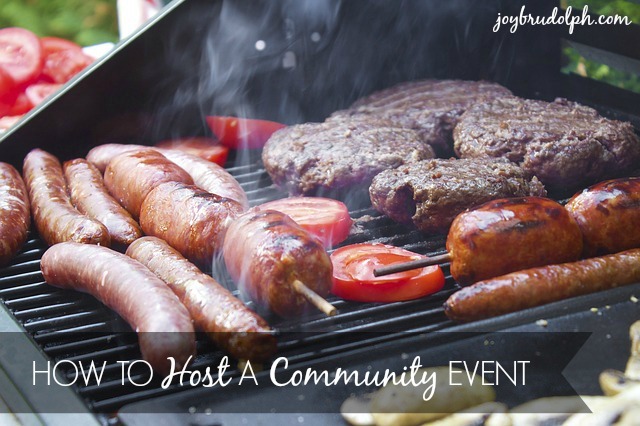 If you don't host events or cook often, a schedule can be really helpful. Setup early. On the day of the event, setup and cook as early as you can. If you have neighbors (or friends) who are willing to help delegate jobs so you can connect with your neighbors and not worry about the details the whole time. Relax and enjoy the time with your neighbors. Do you have any questions on planning community events? I'd love to answer them for you in the comments below. 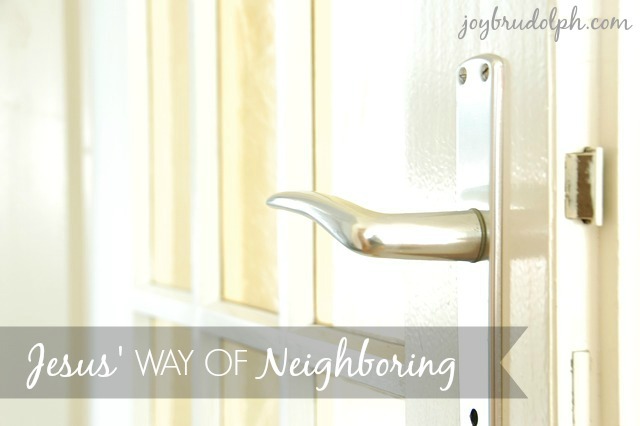 This week we'll discuss some practical tips and tools for engaging your neighbors. Let's start with social media. First of all, to know what tools to use in your neighborhood you have to know your neighbors. If you're in a low income neighborhood perhaps your neighbors don't have computers at home or smartphones and social media is not practical. Are your neighbors on-the-go parents? Are they retired? Are they already using social media or not? Answering these types of questions can help you decide whether social media could be used to enhance community where you live. Facebook: A private Facebook group specifically for those who live closest to you is a great tool for building community. 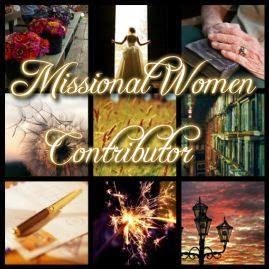 I highly recommend creating and posting group guidelines at the onset of the group. Decide what the goal of the group will be. Is it for sharing needs? Promoting community activities? What is not allowed in the group? Deciding on a purpose early on will help the group to flourish. Instagram: If you live in a younger or trendy neighborhood Instagram is a great tool for posting about upcoming events and sharing community photos and inspiration/encouragement. You could keep the neighborhood profile private if security is a concern. 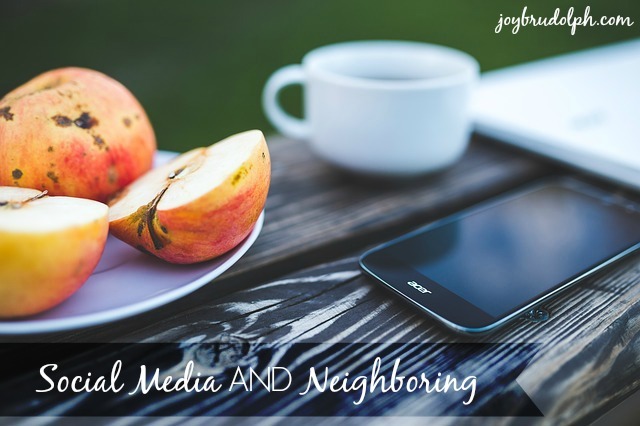 Are you using social media among your neighbors? I'd love to hear from you in the comments below. 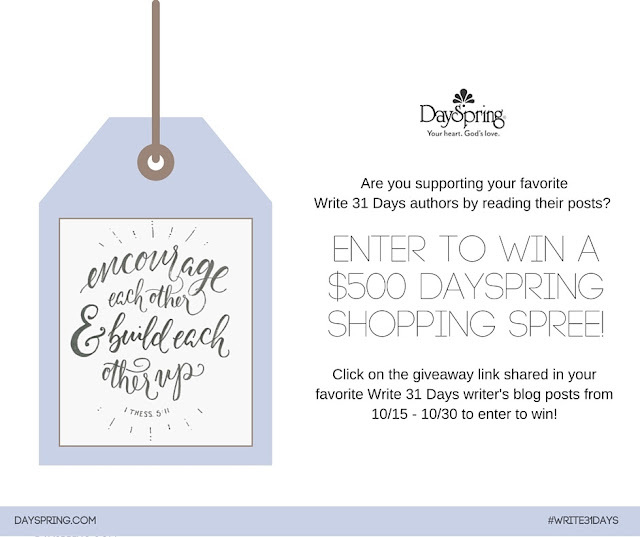 On Saturdays during the month of October I'll share resources to inspire and encourage you on your journey to loving your neighbors. The Unloved Neighbor: how an apartment fir changed everything. 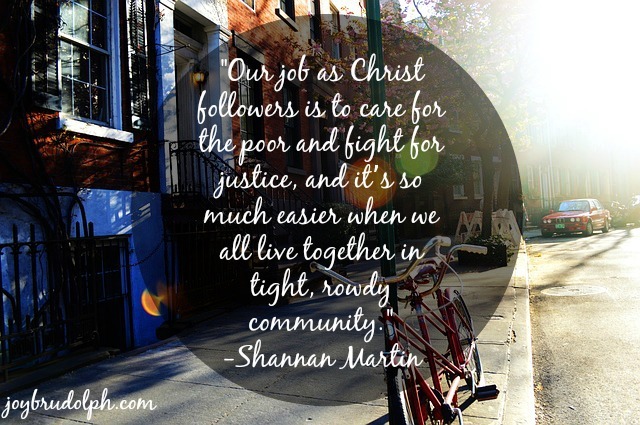 What to do after You Move into the Neighborhood: an interview with Shannan Martin and Lori Harris for inCourage. Do you have any neighboring resources you'd like to share? I'd love to hear from you in the comments below. (On Fridays during this series I'll tell a real life story of community. So maybe one of your neighbors left a note on your door that made you angry. Maybe their words don't mean as much as you thought they did. Maybe when you make offers of community you really mean them but maybe they just say "nice things" not meaning to back them up. Maybe your neighbors urinated on your porch like a friend of mine's did on hers. Maybe on the other side of your bedroom wall is your neighbor's recording studio and perhaps also the headquarter's of his underhanded business. Maybe some days you have to fight harder for joy in neighboring than others. It is on those days that it is best to remember that while neighboring is good for you, it is not all about you. You will have disagreements. You will have boundaries crossed that have to be rebuilt. You will not always see eye to eye. Neighboring is a lot of things. Good things. But one thing it certainly is not is easy. And I know a lot about things that aren't easy and things that are worth doing. And oftentimes they're the same things. So as I write these words I remind myself that while neighboring is a lot of hard things it is also certainly worth it. When you think about neighboring perhaps you think about some kind of obligation. Maybe you simply want to be obedient to the Great Commandment. Perhaps you think it's simply the right thing to do for those who live closest to you. But have you considered where you fall into this equation? You see I don't think God commanded us to love our neighbors only for their benefit. He knew something many of us don't know or have been told not to admit; neighboring is good for us too. When I think of what I really want in my little community, my dream for my neighborhood, if you will, I think of deep, close relationships. I don't want to just know people's names or bring them cookies, I want to share life with them. Healthy relationships are mutual. They require both parties to be able to give and take. Sometimes I pursue my neighbors and sometimes they pursue me. (The exception to this is when one person is in a particularly difficult season of life and needs to be loved and served. However most difficult seasons are thankfully temporary.) Should mutual pursuit ever cease to occur, or stop completely on one side our relationship would suffer. If left unchecked it would eventually die. I have mentioned before how difficult it has been for me to leave my home state for life in Texas this year. I know beyond a shadow of a doubt that being in relationship with my neighbors has been a huge part of what has gotten me through this difficult season. And when I have nothing but questions for God regarding our life here, I see a glimpse of what may be His purpose in this community. Yesterday both Jason and I were sick. One of our neighbors brought us lunch and also spent time outside with our dog. Last night we realised our dog needed to go to the vet today. What a blessing is was to have so many people to call on for help. And before I fell asleep last night we had a plan for getting Sam to the vet. It is good to love and serve others, particularly your neighbors. But it is also good to allow yourself to be loved and served. You are not God's plan for redeeming His creation. Jesus already did that. But God does choose to use you. He plants you in specific places amongst specific people for specific purposes. And sometimes that purpose is you. What if I am afraid to be a good neighbor? 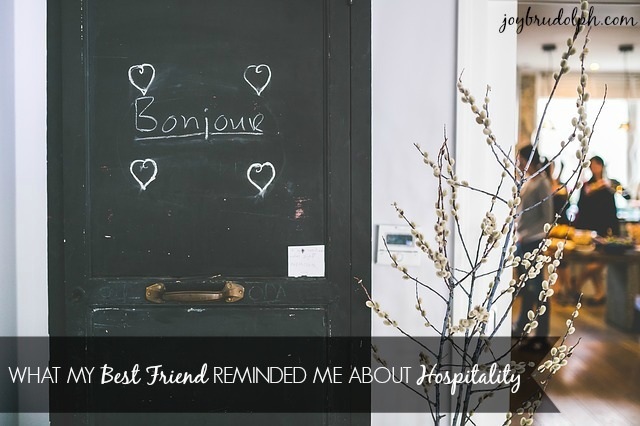 If you’ve been reading this series feeling like being a better neighbor is wonderful, but the idea of forced intimacy that happens when you befriend a neighbor terrifies you, today’s post is for you. If you don’t believe you are enough, it’s going to be tough to open yourself up to the very real risk of neighboring--the risk of indecent exposure. Your neighbors see you take the trash out in your underwear at 5 am, hoping no one will catch you. Your neighbors might hear you say something not-so-nice to your kids on a particularly stressful day. Your neighbors are the most likely candidates to walk in on the tornado that is your house the day before a big presentation at work. If you live in an apartment building and share walls with your neighbors, well, let’s just say they will learn A LOT about you. When we don’t feel good enough, all those moments of exposure can be pretty terrifying. It’s easier to stay strangers and bury our heads in the sand. The high risk of exposing our warts is why being a good neighbor must begin as an inside job. Growing up, all my neighbors were family. Neighboring never made its way into my consciousness until Craig and I moved in together. Craig’s best friend lives just an empty lot away from us. You can see from our laundry room window into theirs. Our backyards look out onto the same lake. When I do yoga on the porch at 5 am, my neighbor waves as she walks the back porch soothing her fussy grandson. From the first moment I dropped anchor here, I was connected with two strangers, by both geography and shared history, and it wasn’t easy for me. For the first time in my life I wondered what the neighbors would think if I walked outside in my nightgown or chased my boys around in the yard. Whether or not being neighborly comes naturally to you, it comes down to how you feel about yourself. If you feel like you are enough, you will be able to separate fear from reality, set healthy boundaries, and be a neutral safe place for all. The biggest fear most of us have about being friendly with the neighbors comes from a fear of judgement. We are afraid that our flaws will condemn us, usually because we are judging the flaws of others. Think about it this way, if you hear your neighbor impatiently yelling at her son while she jockeys him into the house--arms laden with groceries and backpacks--do you offer to help or assume she’s a terrible mother? Be honest. Most of us roll our eyes and assume she needs to read a book or two about parenting. Then, we will turn around and worry that she thinks the same thing about us when we repeat the action from our own driveway the next afternoon. If you have children, you’ve probably lost your patience a dozen or more times over the past week. If you don’t have children, insert your husband/dog/cat here. If you can recognize that you are afraid of the same type of judgement you dole out, then you can break that cycle and be a good neighbor. If you know that you are good enough, it’s much easier to believe your neighbors are too. If you believe that stressed-out mom is doing the best she can, it’s easier to believe that she will give you the same grace. Walk across the yard and take her groceries. Leave the judgement at the door. If you can do that for someone else, you’re less likely to feel judged yourself and be more open to making friends with the neighbors. Once you open the door to a friendship with those who live in close proximity it’s easy to feel overwhelmed by their constant presence. Being friendly with the neighbors often means you will have company when you want to be alone and it opens up the possibility of constant intrusions into your privacy. Everyone has varying degrees of comfort with this, so it is essential to recognize your own needs and set boundaries early on in the relationship. Our neighbors, Mark and Marty, have a pool. My boys love to swim and our two families have shared thousands of wonderful moments on their deck. But we have a rule, before we go over to swim we text Marty to see what’s happening in their world before we subject them to two rowdy boys. On Sundays during football season I open my home to pretty much anyone who wants to eat well, watch a game and celebrate with us. But on weekdays no one crosses the path after 7 pm unless it’s an emergency. Rigid rules like these may not be your style, but for an introvert like me-- a woman who doesn’t do impromptu plans well--these boundaries allow me to be open with my neighbors while still feeling in control of my space. Couples fight. Parents and children (particularly teenagers) do too. If you’re going to commune with your neighborhood, learn to make like Switzerland and stay out of it. Taking sides in an argument will end up burning you, one way or the other. You can be a safe place to go, a listening ear and a shoulder to cry on...But never never never take sides. Even when it’s difficult not to, even when you think you know exactly who is right and who is wrong. Recognizing that our own reactions to other people’s conflicts usually have more to do with us than them can help. Unless abuse is involved, it helps no one for you to take sides or step in--sometimes it doesn’t even then. If you are afraid for someone’s safety, please involve the proper authorities. In all other cases, stay out of it. When you build a reputation as a safe and neutral zone your neighbors are more likely to come to you when they need help and you greatly reduce the risk of hurting your relationships with your own judgement. Maybe, if you find this whole idea of neighboring daunting, the best place to start is with a simple prayer or meditation. 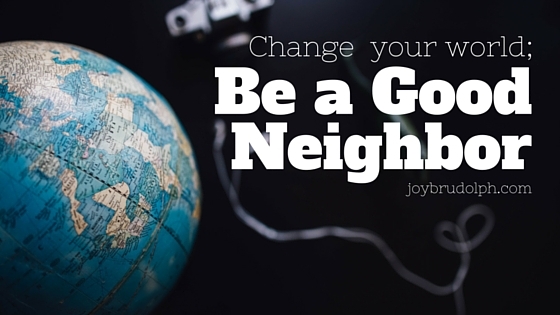 Being a good neighbor begins and ends with the belief that you, in all your flawed glory, are enough. Once you internalize this it will be much easier to make friends with the people who share your walls, your driveway, or your street. Help me to love myself as much as I am called to love my neighbor. Fill me up with love and light until my cup cannot help but run over and into the lives of those around me. Sometimes we have to step back and be neighborly with ourselves before we have the bandwidth to be neighborly with anyone else. Renia Carsillo is an advocate for whole foods, fierce women and writing yourself strong. Renia spent years being quiet to be successful in business and learned the hard way that financial success matters only if it has purpose. 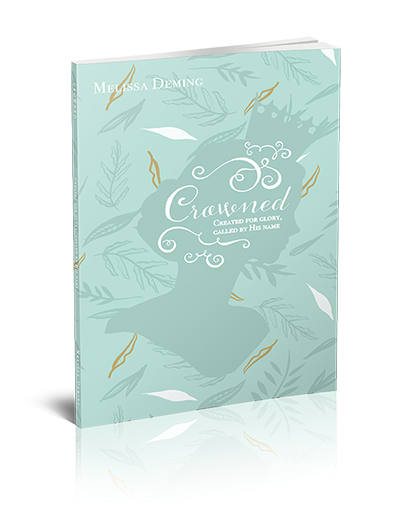 With a strong and often controversial style, Renia writes and cooks for women who are tired of playing it safe. She is the author of three books, including her recently released memoir, BornHungry. 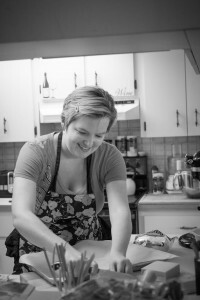 Today she writes and coaches women about body image, eating for pleasure, and living with moxie at bearealbeauty.com. Renia can usually be found with a spatula in one hand and a pen in the other. She hasn't decided yet which is the better compass for lost days. Geta free copy of the BeA Real Beauty 30-Day Meal Planning Guidehere. I sit to write this post, four kids from the neighborhood shoot hoops in the driveway, two small girls have a picnic on the sidewalk, and four kids roast marshmallows in the backyard. Three girls have just left styrofoam cups of water on my desk, the picnic table in the front yard while they hurry off to the corner market for more Takis. They lick the hot seasoning from the chips before munching down the acutal chip and when there's a crowd, the Takis go fast. I'm working towards a deadline, but the kids are oblivious to my fingers furiously pecking keys. Thebasketball needs some more air. You think you can ask Mr. Thad to pump it up for us? My inner nature is screaming for three hours of quiet with no little people writing their own version ofIf You Give A Mouse A Cookie into my very life. This kind of loud, in your face neighboring presses into my self-centered heart and messes with my self-righteousness. I like neighboring when neighboring is neatly scheduled into my life. I like the kind of neighboring that costs me nothing more than a wave and a smile. I like neighboring when it happens with people just like me, on days that I have penciled in on my calendar with distinct beginning and ending times. Basically, I like neighboring on my terms- when I've thought out the plan and executed it in ways that showcase my strengths, like hosting a dinner party. But that kind of neighboring is not what Jesus had in mind when He commanded us to love our neighbors as ourselves. When Jesus commanded us to love our neighbors, He was asking us to re-imagine our families ties. He was asking us to widen our circle to include those closest to us, literally. 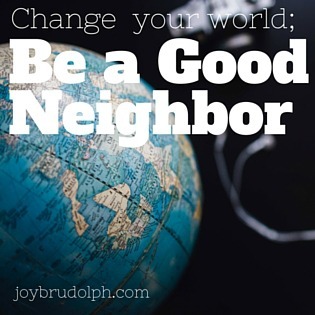 We love to take the Great Commandment and make the word neighbor to mean every human on planet earth because if we can generlize who our neighbors are, we don't have to actually love our literal neighbors. Jesus expects of us. Jesus is inviting us to put down roots, right where we live and love those closest to us- even if they are nothing like us. And He is inviting us to love them on their terms, on their turf, and in their timing. When we first moved onto Avent street, we moved in with a pre-set script for living and loving and serving. We had an entire arsenal of things we thought would help us reach our neighbors with the hope of the Gospel. We pulled out a calendar and penciled in all sorts of neighborhood outreach events and for two years, we worked our plan. We passed out loaves of bread and repaired homes and hosted movie nights on the lawn. If you can think it up, we probably did it and spent a great deal of dollars doing it. But in our third year of making crazy and doing all that we knew to do, we just sorta ditched everything and just plain quit. We were seeing zero fruit and although we knew our neighbors' names, we didn't know our neighbors. We spent the whole next year, simply living in our house on Avent street. We put picnic tables in the front yard and started leaving the side gate open to the backyard when we had bonfires. If kids wandered into the yard, we served them Little Debbies and kool-aid. We spent countless hours on the front porch. We opened up our home and our yard and blurred the lines between us and them. We began to live with lives wide open, taking in whoever walked down the sidewalk in front of our house. Our neighbors starting coming to see us. In droves. Our life became one big interruption after another and we soon came to realize that everytime someone knocked on the front door of our house, we were being invited into what Jesus was doing in our neighborhood. Over time, we began to see these interruptions as the tangible evidence of Jesus at work in our community. He was working a plan that we could not control or manipulate with our own desire to do something good for our neighbors. These interruptions served as a signal that said we needed to stop what we were doing, open the front door, and enter into the lives of whoever was on the other side of the threshold because Jesus was already at work and He was simply giving us a front row seat. As we seek to make the Great Commandment our life's mission, we would do well to aim small and see our distinct communities as our specific mission fields. Jesus has placed us, right where He wants us because He is already at work in the lives of those who live around us. Our job is to live lives that welcome others in. Jesus does not need our grand plans or our color coded calendars filled to the gills with programs. Jesus needs people who will simply open the front door and welcome others in. Lori Harris is a Southern born, Texas-missing girl, who is rearing her six kids in a neighborhood some would call the ‘hood. She and her bi-vocational husband have planted Fellowship Bible Church Rocky Mount on the wrong side of the railroad tracks where poverty runs deep and racism even deeper. She passes out PBJs to the neighborhood kids, and brews coffee just to make the house smell like Jesus. She writes at loriharris.me. On Sundays during the month of October, I'll share a prayer or quote for you to reflect on as you consider your role in fulfilling the Great Commandment. 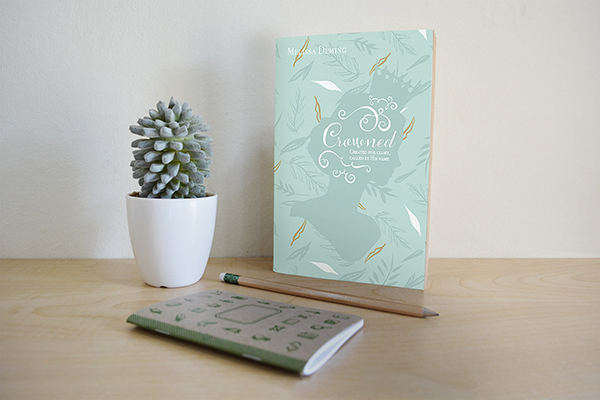 I love this interview with Shannan Martin and Lori Harris for inCourage. I hope it encourages and inspires you. This post is part of the 31 Days of Neigboring series. "What would it look like for the church to wake up to its true identity as a community meant to be in the streets and gutters with people? What would it look like for disciples of Jesus Christ to go into the darkest place where no one else is willing to go to rescue people and bring them to the hope that's in Jesus Christ? 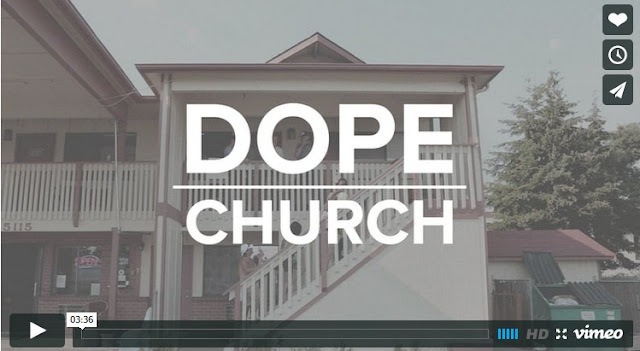 What would it look like to be on mission here with our neighbors that are struggling?" On Saturdays during the month of October I'll included resources that will inspire and encourage you on your journey toward loving your neighbors. I love the video above from Verge Network. I hope you will too.